Patrick Hruby: The Texas Rangers' two-foot hot dog will hijack your brain! 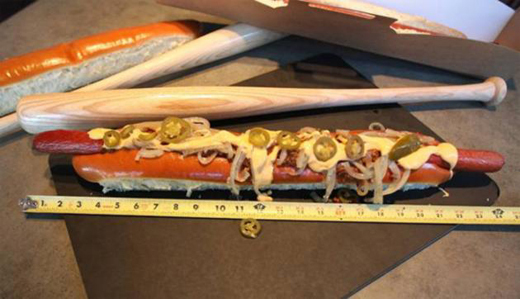 The Texas Rangers' two-foot hot dog will hijack your brain! Gaze upon it, ye deep-fried chicken fingers, ye oversized soft ice cream cones, ye sagging baskets of chili-cheese nachos. And despair. 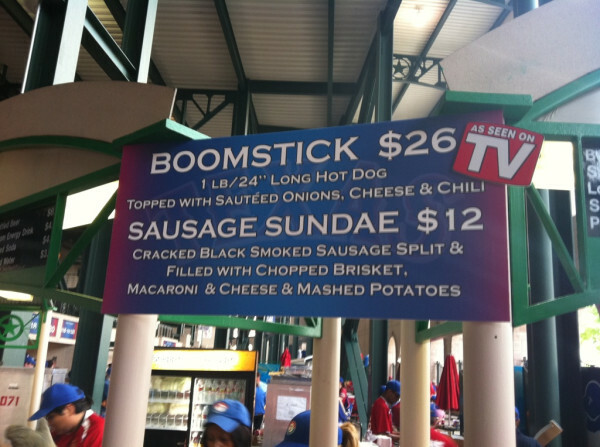 As many of you already are aware, the Texas Rangers have introduced a ballpark entree fit for Kobayashi: a one-pound, two-foot long hot dog -- topped with chili, cheese, jalapenos and onions, wrapped inside an challa bun, all for the low, low price of $26. Some see the Rangers' Megadog as the ultimate expression of All-American excess. Others see FREEDOM! Me? I see a culinary weapon of mass destruction. A food terrorist. An unassuming cerebral hostage-taker, intent on commandeering your free will. Remember the alien ear worms in "Star Trek: The Wrath of Khan?" The ones that turned Chekov and that expendable other dude into mentally-malleable stooges, devoid of willpower? Texas' hot dog is basically the same thing. 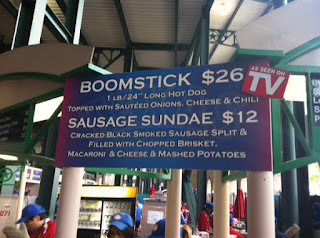 As I wrote for ESPN.com a few years back, ballpark food hijacks your brain -- and if you understand how and why, you can start to understand why our nation suffers from an obesity epidemic, why America the Free has become America the Free-of-Size-32-Belts, but Probably-Not-Free-of-Type-2-Diabetes. Ask David Kessler. A Harvard- and University of Chicago-educated doctor, lawyer and former head of the Food and Drug Administration, he's also the author of the best-selling "The End of Overeating," in which he argues that processed food loaded with fat, sugar and salt -- essentially, ballpark chow -- alters our neurological circuitry, chemically compelling us to eat ... and eat ... and eat ... and eat some more, until our bulging waistlines match our sagging sense of self-control, all while a manipulative food industry creates ever-more-tantalizing grub that makes us fatter and hungrier still. * Fat, sugar and salt also trigger the production of dopamine, a brain chemical that stokes and regulates desire by increasing the attention we direct toward a particular pleasure and the gusto with which we chase it. * As such, Kessler argued, fat, sugar and salt hijack our brains by making food "hyperpalatable." A hyperpalatable food doesn't just taste good; it produces strong motivation to pursue that taste. In study after study, animals given hyperpalatable foods gorge themselves and become fat; in one experiment, animals whose neural reward centers had been stimulated were willing to cross an electrified floor for food, getting shocked in the process, even if they had just eaten. And this why most human diets fail: fueled by hyperpalatable goodies like chicken fingers and chocolate chip cookies, the chemical drive for reward overpowers rational thought. * Worse still: Over time, hyperpalatable foods rewire our mental circuitry so that the brain's dopamine pathways -- the same pathways that light up in response to alcohol, drugs and Olivia Wilde -- activate at the mere suggestion of food. For instance, the smell of grilled chicken. Or a sign reading BBQ. Or the cries of a beer vendor. Kessler called these suggestions "food cues." Everyone learns them through individual life experience. A cue can be a sound (think Pavlov's famous bell, causing dogs to salivate), a sight (a fast food restaurant's conspicuous Golden Arches), a mood (always eating when elated/depressed), even an emotional memory (cookies just like grandma baked). Ballparks are full of food cues that capture your attention, arouse desire and prime you for gustatory action. More importantly, they do all of the preceding whether you want them to or not: In one study, people given a snack high in fat and sugar for five straight mornings reported craving something sweet at the same time for days afterward. * And so: a food cue triggers a dopamine-fueled urge. Dopamine narrows our focus and leads us to food. Eating stimulates our reward centers, producing opioids, pleasure and relief. The cycle repeats. Over time, it becomes unthinking, almost automatic, a food-centric operating system installed into our mental circuitry. "We like to think of ourselves as rational," Kessler told me. "That all our actions and decisions are thinking. But many of our actions have become conditioned. We all learn in high school about Pavlov's dogs. Pavlov didn't get the power of these stimuli." I can only imagine what Kessler would have thought about the Ranger's Megadog.